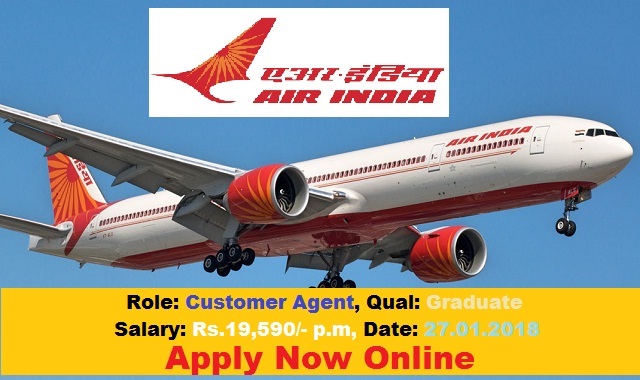 AIATSL Recruitment 2018 2019 Application Form for 121 Handyman, Customer Agent Posts Download Application through Official website www.airindia.in. AIATSL Handyman, Customer Agent Jobs Notification 2018 Released. The Interested and Eligible Candidates are requested to Download Application through Official website. AIATSL Chennai 121 Customer Agent Recruitment 2018 - Apply Online. Handyman - Must have minimum experience of six months at Chennai Airport in any of the areas or combination thereof, of Terminal Functions, Ramp Functions like Baggage / Cargo /Loading / Unloading and Aircraft Cabin Cleaning area with any Airline or Ground Handling Agency. The candidate should hold a valid AEP. Customer Agent - Graduate in any discipline / faculty(minimum 3 years’ duration) from a recognised University with knowledge of basic computer operations. + Candidates having experience in aviation industry will be preferred. Applicants meeting with the eligibility criteria mentioned in this advertisement, as on 1st January 2018, are required to WALK-IN in person, to the venue, on the date and time as specified above along with the Application Form duly filled-in & copies of the testimonials/certificates (as per attached application format with this advertisement) and non-refundable Application Fee of Rs.500/- (Rupees Five Hundred Only) by means of a Demand Draft in favour of “AIR INDIA AIR TRANSPORT SERVICES LTD.”, payable at Mumbai. No fees is to be paid by Ex-servicemen / candidates belonging to SC/ST communities. Please write your Full Name, & Mobile.No. at the reverse side of the Demand Draft. Chennai 600 083 (Near Ashok Pillar)"